With autumn coming closer on the morning breeze, the garden is slowing down. The horse chestnut is rusting away, the rocket has disappeared completely. The carrots have been exhausted, while the garlic harvest is hanging in the shed. The courgette plants still pretend to flower, but I know it's not much more than habit. 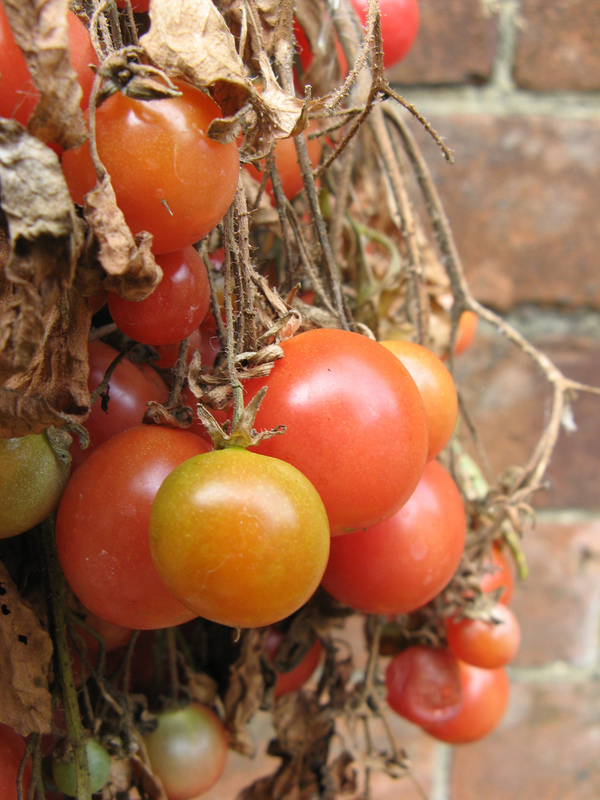 And the cherry tomatoes are heavily laden, but unable to resist the dying of the light. 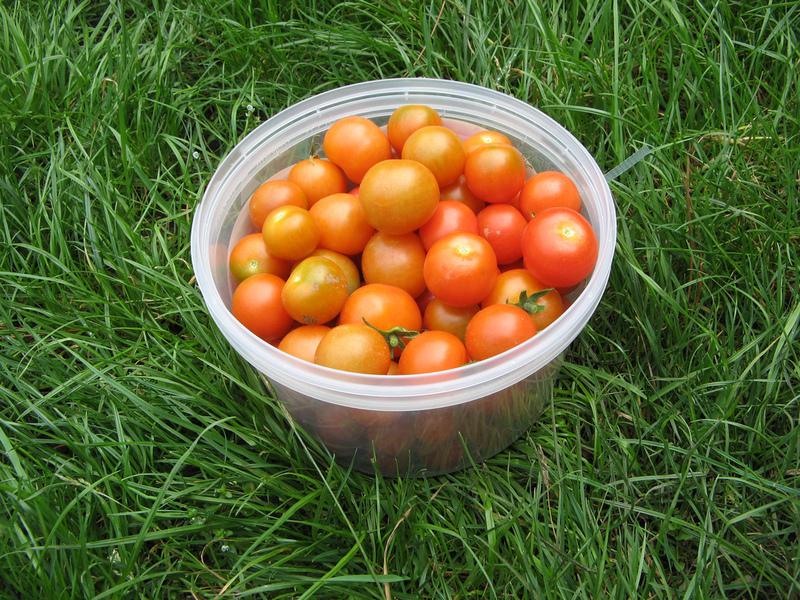 So on a chilly afternoon, I picked all the remaining tomatoes. A big tub full, 150 Haribo Happy Cherries equivalent. Sliced in half, sprinkled with salt, pepper and oregano, then into the oven at 120-150 degrees for a number of hours. Some were leathery, others just shrivelled and vaguely warm. But all were sweeter, smaller and more intense. From there they went into a small jar, and covered with olive oil. I had planned various different uses over a number of weeks, but they all quickly disappeared into three sessions of pasta. 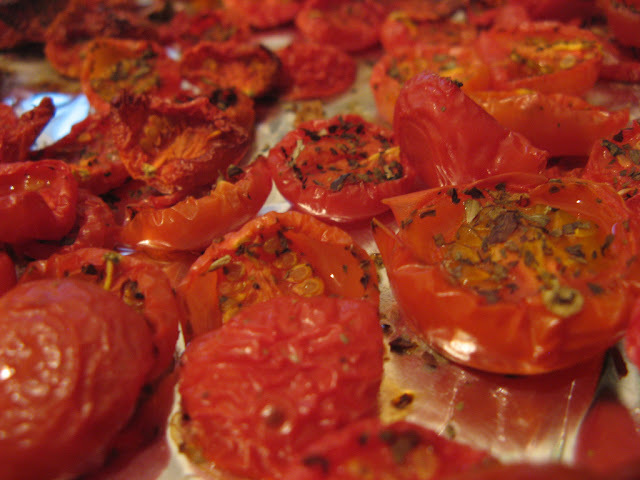 Always heavy with herbs, with a good whiff of garlic, sometimes feta and coarse black pepper too. We also picked our last ones today - tomato blight got the plants (again!!) but not before we got tons of the sweetest and most flavourful red and yellow cherry tomatoes. Fantastic! Those that aren't ripe yet will go into my green tomato & aple chutney. Stand back, Mrs Balls!